It is common in historical reenacting to assert that sailors often went barefoot when afloat, but what do the sources say? Very few images depict sailors entirely barefoot. I have examined well over 400 images created between 1740-1790, ranging from high art to political cartoons and everything in between. Of these, only three shows sailors with neither shoes nor stockings. 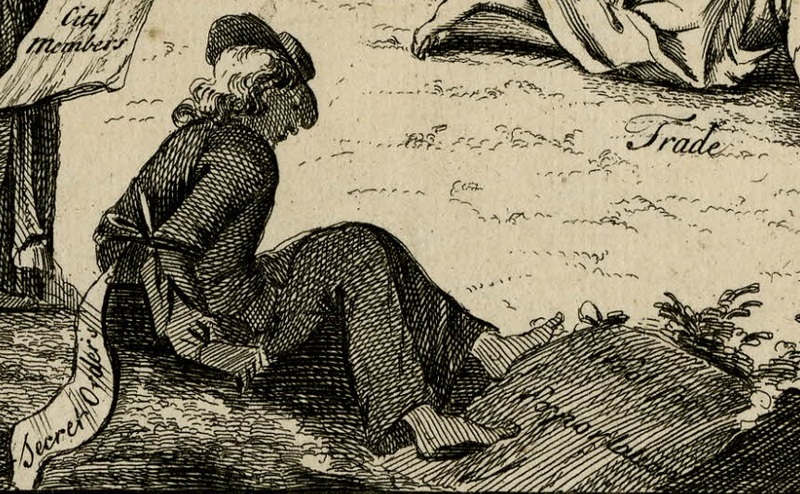 The earliest depiction in my era of study is a political cartoon that includes a pair of barefoot sailors. Notably they are ashore, and the point of the cartoon is to show them dis-empowered and in the thrall of an enemy. 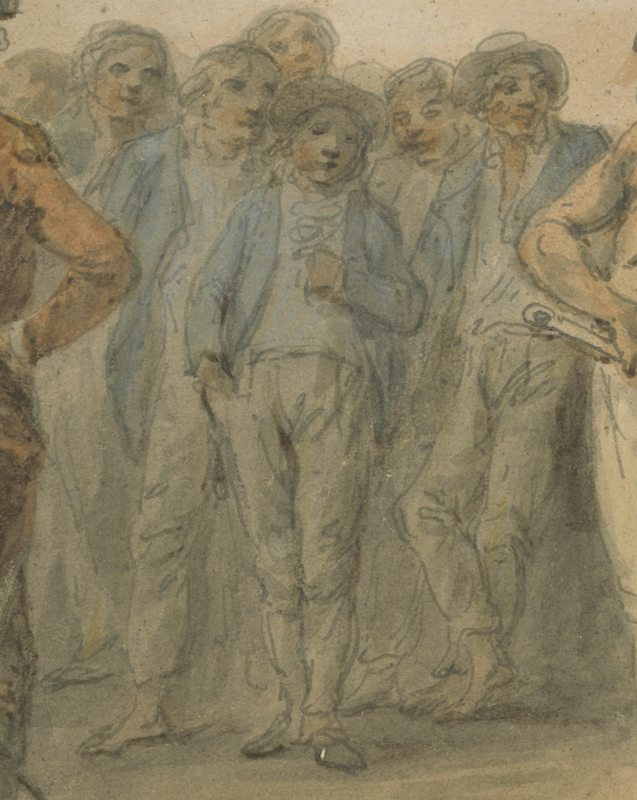 It could be that the artist, Samuel Lyne, was intending to show a certain poverty among the sailors. Detail from Bob the Political Ballance Master, Samuel Lyne, 1742, British Museum. Less ambiguous is Thomas Hearne's portrayal of a sailor working on the 20 gun Deal Castle. 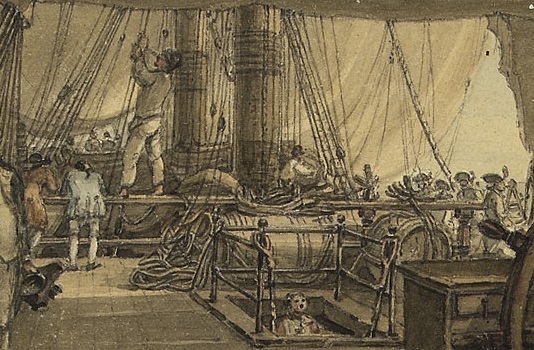 Though painted in 1804, Hearne was present for the 1775 voyage, and based the painting on sketches taken at the time. 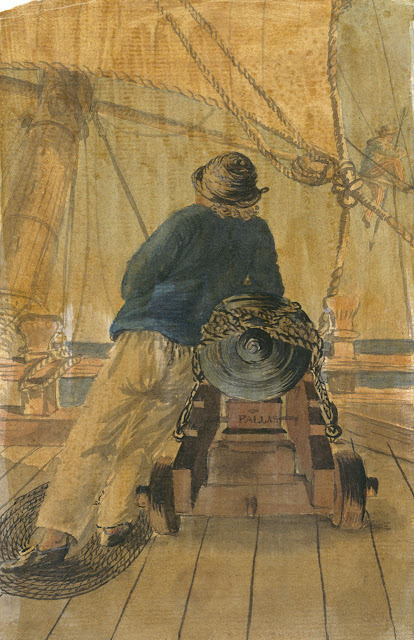 Thomas Hearne, 1804, National Maritime Museum. Julius Caesar Ibbetson also depicts sailors afloat without shoes or stockings, but they are mixed between both men with shod feet and those without. Like Hearne, he was present for this event, and illustrated it at is happened. Julius Caesar Ibbetson, c.1788, Yale Center for British Art. As with Ibbetson and Hearne, Gabriel Bray painted the below from life. Bray is made all the more reliable an artist by the fact that he was a naval officer, and more intimately familiar with sailors and their ways. In this we see that the sailors both on deck and aloft wear shoes. However, the sailor leaning on the gun is clearly without stockings. Gabriel Bray, 1775, National Maritime Museum. The common sailors themselves have little to say on the matter. Like most material culture in this class, it was not considered remarkable enough to record, and no journal, memoir, or novel penned by a common sailor that I have read has yet cast much light on this. When sailors do mention going barefoot, it is only as an exception and in an unusual circumstance. I having no shoes, I could scarcely walk. He rode ahead to New Castel and bought me a pair of shoes and had a dinner provided for us all. In a few days we arived in Philadelphia, but my feet were so inflamed I could not put them to the flore. Having neither shoes nor stockings this called my feet severely, as well as my shoulder, having nothing on it but a shirt or canvas frock. Here I shall give the reader a rough draught of my Garb as I then appear'd. (Viz) a long pair of ragged and narrow Spanish trowsers, a fragment of an old blue Shirt not enough to pass under my waistband, a remnant of an old Red handkerchief round my head, without either shoe or stocking to my feet. I had yet my old blue bonnet. Depictions of sailors and their own words do not provide us much evidence for working afloat without shoes. This is by no means definitive, and there is more research to be done. Working barefoot probably occurred (the evidence from Hearne's Deal Castle painting is compelling), but it is impossible to say how frequently this happened.